So I took it one step further! That potato bread is officially a staple here! 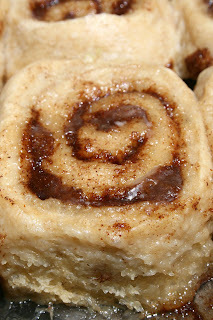 So, I decided that since it is so soft and yummy that I would make some cinnamon rolls with the basic dough. I made a couple of changes just to see what would happen and we all liked it so much, that it was gone by the end of the day! 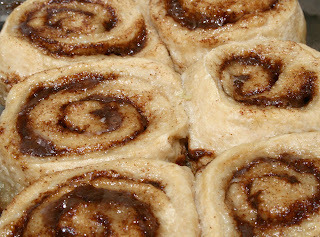 I also made a cinnamon swirl loaf with another batch of dough and that one is gone now too...before I got a shot of it. So, my family is loving this and I am happy because it has some whole grain in it, it is low fat and it has no crazy preservatives in it! As for the cinnamon buns, we have different opinions on how much glaze is needed. Most of us like a light glaze, so that is what I do on the whole pan. The the other one...he gets a little extra on his individual buns! Heat soymilk in the microwave for about 1 minute (to 120-130 degrees). In a bowl, mash the potato and applesauce until smooth (I used a fork). In a separate mixing bowl, combine the yeast, 2 cups of flour and salt. Add the soymilk and potato mixture to the flour mixture and mix until combined. Add more flour a 1/4 cup at a time. I used 2 1/2 cups at this point. Knead dough for 5 minutes (I did this in my mixer). Spray a large bowl with cooking spray and then place your kneaded dough in it. Turn in over to coat the top of the dough. Dampen a towel with water and microwave it for 1 minute. Place the warm towel over the dough and place it in the microwave...don't turn it back on (this forms a nice proofing box) - or put it in a warm place. Let the dough rise for about an hour or until doubled in size. Combine the filling ingredients with a fork. Next, spray an 11 x 7 baking pan with cooking spray. On a Silpat or floured counter roll the dough into a 12 x 10 rectangle. Sprinkle the filling mixture on the dough evenly and press it in a little. Roll the dough up starting with the long end. Press the seem to seal. Cut into 12 equal buns. Place in the prepared dish. Microwave the towel for about a minute. Place the warm towel over the rolls and place them back in the microwave or a warm place. Let rise for 30 minutes to an hour until doubled in size. Place in a preheated 375 degree oven for 15-20 minutes. Bake until golden brown. Cover with a towel and place in the refrigerator over night. Pull out of the fridge in the morning and microwave the towel for about a minute. Place the warm towel over the rolls and place them back in the microwave or a warm place to double in size, about 30 minutes. Place in a preheated 375 degree oven for 15-20 minutes. Bake until golden brown and still gooey! Combine glaze ingredients and mix until smooth. Pour over warm rolls and eat! I have discovered that a lot of things that I make are brown. I am going to work on that! Oh my! Those cinnamon buns look soo tasty!